The baking phenomenon is in full swing, partly thanks to that well-known baking show that has controversially moved to Channel 4 – The Great British Bake Off. We love GBBO here at Red Letter Days, so in homage to our favourite programme and our new favourite pastime, we spoke to Seasoned Cookery School, who have given us a delicious bread baking recipe for you to recreate at home! Seasoned Cookery School, located in the heart of Derbyshire is one of the UK’s leading cookery schools. The school specialise in inspirational courses, taught by over 20 passionate chefs. With over 25 different cooking and baking courses available including bread making, Indian and Italian cookery courses, Seasoned Cookery School offers something to suit every capability. 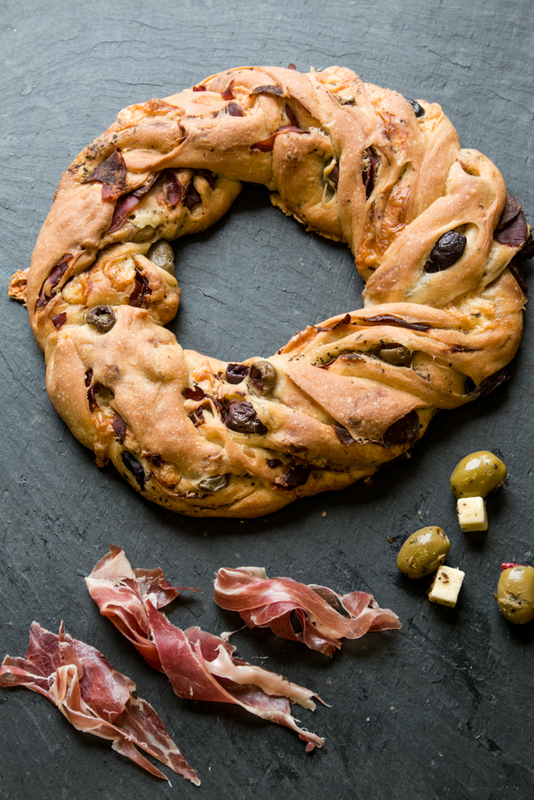 In the spirit of GBBO, why not try making this simple and delicious serrano ham, olive and feta couronne bread recipe a go! 1) Mix the bread ingredients together in a food mixer on a slow speed. Combine with water and start the kneading process. Knead for 6 – 8 minutes until the dough is soft and stretchy. 2) Knead for 2 minutes on the work surface and then shape into a ball. Put the ball of dough into a clean, lightly greased mixing bowl and cover the bowl loosely with a clear bag or cling film. Allow the dough to prove in a warm place until doublesssss in size. This takes approximately 1 – 1.5 hours. 3) Tip out the dough onto a work surface and lightly grease it with olive oil. Roll out gently into a 60 x 30cm rectangle, with the longest side facing you. 4) Spread the prosciutto, olives and feta over the top. Make sure you don’t fully cover the dough, otherwise it won’t be able to ‘stick together’ if you over fill it. 5) Roll up the dough tightly (like you would a swiss roll) and then cut it in half length ways (leaving the top 5 cm intact) to expose the gorgeous filling. 6) Twist the two strands of dough together, so the filling is exposed and the ends come together to form a circle. The dough is more forgiving than you think, so be confident! 7) Put the dough on a lightly greased baking tray. Cover it with a clear bag / lightly with oiled cling film and allow it to prove for 45 minutes. 8) Heat the oven to 200 degrees C and bake for 35 minutes or until the couronne looks golden and the base sounds hollow. 9) Leave to rest for 15 – 20 minutes and then serve it up warm. For more baking and cooking inspiration check out our recipes section on the blog and share your creations with us on social media!